“We wanted to collect the questions, stories and struggles we were receiving from young people and take them to the church,” said Jenny Salisbury. 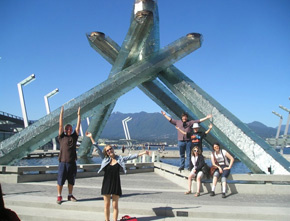 Salisbury was director of a drama troupe composed of young people which toured Canada this summer. Roots Among The Rocks was presented more than 40 times in three months in churches and community centres from Newfoundland to Vancouver Island. The tour was the brainchild of Salisbury and Judy Steers. The two direct the Ask & Imagine program at Huron University College, an Anglican school affiliated with the University of Western Ontario. Ask & Imagine is a two-week leadership and theological formation program offered every May for young adults (ages 18-25) and every August for high school students. When they pondered what they could do to celebrate the 10th anniversary of the program, Salisbury and Steers came up with the idea of the drama troupe. It was a natural for Salisbury, who is a professional freelance director and playwright – in addition to working with Ask & Imagine, serving as part-time youth minister at St. Clement’s Anglican Church in Toronto and teaching a course in acting and script analysis at Sheridan College in Oakville, Ontario. In the end, Salisbury served as director and and actor for the project, while Steers served as producer. This freed Steers from having to tour with the troupe for the whole summer. It took about a year to get the idea approved and the funding in place. Then the two women began looking for young adults with acting experience willing to take on the project as a summer job. In May, the assembled troupe began working on the script using a technique called called “collective theatre creation.” Each actor was asked to interview four people whose faith stories interested them, whether or not those being interviewed were committed Christians. During this “production month,” they also interacted with the young adults in the Ask & Imagine program, collecting more stories and questions. Altogether, about 70 people were interviewed. The troupe then combined the interviews with research and improvisation to create a script. One actor’s research into St. Augustine became a significant component of the final draft. Roots Among The Rocks was presented mostly to church congregations, but some attenders were not church people at all. Crowd size ranged from 12 people to 400 people (plus 200 more online) at the Anglican Church of Canada General Synod. A lot of people were surprised to discover that even though it was produced by young people, Roots was “a play for the whole church,” Salibury said. The point was to take the issues young people are wrestling with and present them to the church. Besides Salisbury, the actors were young adults from across the country. Karyn Guenther from Abbotsford, B.C., is working on a fine arts degree in acting at Trinity Western University. Melissa O’Leary Glover of Prince George, B.C., has just graduated from Mount Royal Theatre of the Arts in Calgary. Magdalena Jennings of Vankleek Hill, Ontario, is a student in philosophy and German at King’s College in Halifax. Carolyn Pugh is studying mathematics and computer science at the University of Guelph in Ontario. John-Daniel Steele of Victoria, B.C., decided over the summer to enroll at Huron University College in the fall. The generosity also included financial support. Besides Huron, the troupe received backing from the Anglican Foundation, the Westminster Foundation, the Sacred Arts Trust and the Lilly Foundation. The cross-Canada tour is wrapping up with a final performance Friday, August 27 at St Christopher’s Anglican Church in Burlington, Ontario. But that is not the end, Salisbury said. The troupe has been invited to present two shows and speak at the annual youth convention of the Anglican Diocese of Nova Scotia and Prince Edward Island in November. Salisbury and Steers are working at creating a DVD of the performance, along with a study guide for use in churches. The troupe may also do a “reunion tour” using the same play next summer. They may also do an all new show for 2013 to coincide with the next Anglican Church of Canada General Synod.